Haha! I actually noticed that they would dispense when I got too close to them, like they were a little too eager to please! Or maybe they got scared and “inked”, like the little squid in Finding Nemo. Either way, I thought they were really cool, and Wes was an especially big fan of them. And this is why Wesley and I are friends. We appreciate the same things in life. Like soap dispensers we don’t further desanitize our hands with by touching them. 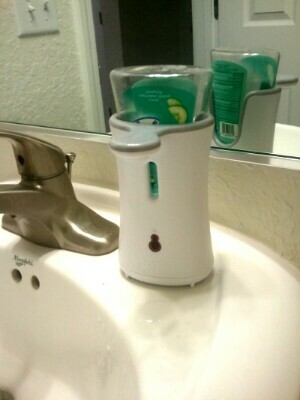 I love my automatic hand soap dispensers. And, apparently I overreacted a bit because I just changed their batteries and they’re find now. My bad. At least our ghosts keep their hands clean.